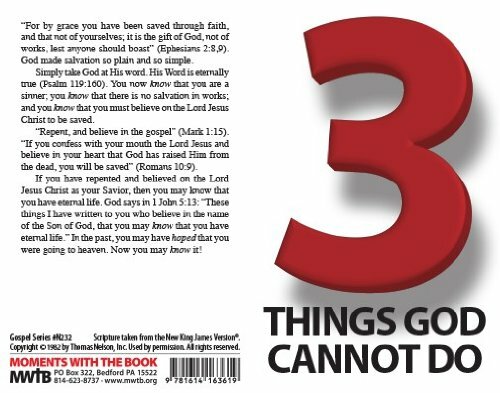 This catchy tract explains that there are three things God cannot do: He cannot lie, He cannot change, and He cannot allow sinners into heaven. Shrink-wrapped in packets of 100. 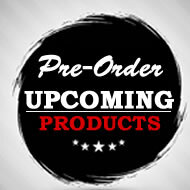 Also available in packets of 20. 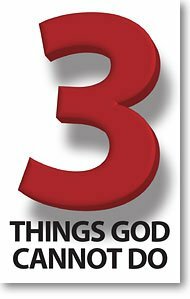 Are there really 3 things that God cannot do? Can't God do everything? Let's take a look at God's own Word to see what He Himself tells us. "Ahh," you say, "yes, I believe that God cannot lie." This may seem rather obvious or even a trick answer, but nevertheless absolutely true. 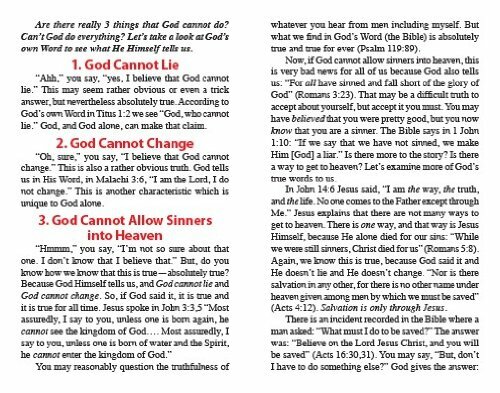 According to God's own Word in Titus 1:2 we see "God, who cannot lie." God, and God alone, can make that claim. "Oh, sure," you say, "I believe that God cannot change." This is also a rather obvious truth. God tells us in His Word, in Malachi 3:6, "I am the Lord, I do not change." This is another characteristic which is unique to God alone. "Hmmm," you say, "I'm not so sure about that one. I don't know that I believe that." But, do you know how we know that this is true--absolutely true? Because God Himself tells us, and God cannot lie and God cannot change. So, if God said it, it is true and it is true for all time. Jesus spoke in John 3:3,5 "Most assuredly, I say to you, unless one is born again, he cannot see the kingdom of God.... Most assuredly, I say to you, unless one is born of water and the Spirit, he cannot enter the kingdom of God." 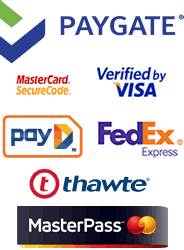 You may reasonably question the truthfulness of whatever you hear from men including myself. But what we find in God's Word (the Bible) is absolutely true and true for ever (Psalm 119:89).